CLEARWATER BEACH – The Clearwater Marine Aquarium is planning a $66-mllion, multi-year expansion. Plans for the expansion include five new dolphin habitats, exhibit space, an elevated deck, the final phase of a 378-space parking structure and a new building for guest and educational space. It will triple the rescued dolphin habitat and the increased volume of water will allow all non-releasable animals more room for exercise, play, and interaction with each other and their human team of animal care specialists. When the expansion is completed in 2020, CMA will be able to double the number of rehabilitation cases being treated at once. There will be more natural underwater rock formations, large viewing windows for both visitors and the animal care team, and the large medical habitat will be equipped with an elevating floor to minimize stress on the animal during medical checkups. The aquarium has frequently had to turn away animals for rehabilitation due to space limitations. This project will allow it to rescue and rehabilitate many more animals and additional species. “Expanding our facility will not only enhance the guest experience but will also improve the quality of life for our non-releasable marine residents and increase care for rescued animals while they are hospitalized receiving life-saving treatments.” said David Yates, president and aquarium CEO. The total project cost is $66 million. CMA has received funding from both the state and the city of Clearwater for this project. In 2017 CMA was awarded $26 million in funding through the Pinellas County Tourist Development Council’s Capital Projects Funding Program for some of the renovations associated with the proposed financing. About $15.9 million of the funding will come from the sale of bonds. Industrial Revenue Bonds are issued by local governments on behalf of qualified manufacturers and 501(c) 3 non-profit organizations and offer tax-free, below-market-rate, long term financing of land, buildings and equipment. Working with Pinellas County Economic Development, the Clearwater Marine Aquarium applied for the $15.9 million IRB financing in January and received approval March 20. “We are pleased to work with the Clearwater Marine Aquarium to help expand their facilities to further their mission of rescuing and rehabilitating marine animals and educating our citizens and visitors about the importance of conservation and sustainable ecosystems,” Pinellas County Commissioner Ken Welch said. The aquarium’s attendance has grown more than four-fold since 2012 thanks to the aquarium’s most famous resident and movie star, Winter the Dolphin. The 2011 Dolphin Tale movie and its 2014 sequel tell the story of Winter, an Atlantic bottlenose dolphin who lost her tail after becoming entangled in a crab trap, but learned to swim without a tail and with a prosthetic tail. Winter and the story of her prosthetic tail has inspired millions to persevere through life’s toughest obstacles. “Our mission has always been about rescue, rehabilitation and education, but it’s exciting to think of the impact we can have on our community; as Clearwater Beach’s number one tourist attraction, we’re proud to call Pinellas County home and we’ll be even more proud to say that we’ve helped to add jobs and revenue to the local economy,” Yates said. For information about Winter and the Clearwater Marine Aquarium, go to seewinter.com. 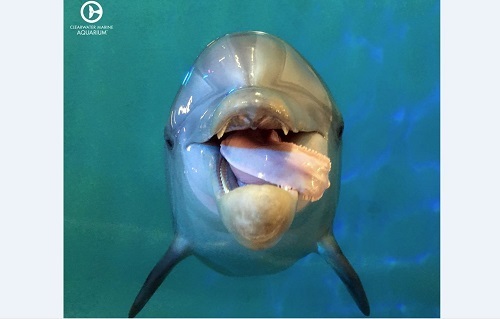 Photos of Winter (main photo) and Hope (in-story photo) courtesy of the Clearwater Marine Aquarium.